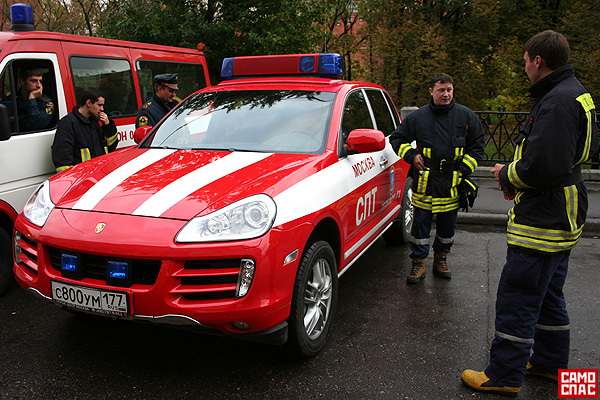 It’s not quite clear why do the firefighter squad needs a Porsche SUV, but they have it. Surely there is a domestic Russian vehicle that would fill the same requirement. You are right,but commission mafia don`t like their local vehicles and equipments.Soviet and now Russians have very long list of specialised vehicles.if local authority decides purchasing local vehicles,they might save big amount and may be 3 or 4 more vehicles instead of one! ! ! ! !. ”откаты” in english are called “cashbacks”. 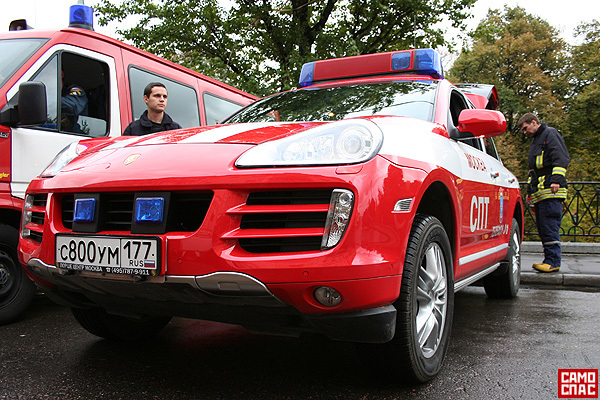 This special edition Cayenne was presented to firemen by Porsche AG on Moscow’s 860th anniversary. Porsche just opened its flagship dealership in Moscow. maybe they think, that they are being cool, but to me it is just a foolish waste of resources. unless, of course, this is a cunning marketing move from Porsche dealers. This is a long-range dispatch firefighting unit. Its not for getting two blocks down the street. It’s for literally traveling sixty miles to a fire. You have to understand how large Russia is, and how remote some areas are. Once you grasp how HUGE Russia really is, it makes perfect sense to have a high performance vehicle for long-range jobs. Would you want a Hyundai on your two hundred mile, one hundred mile per hour trek into the woods to put out a blaze? This is not in the provinces, however. 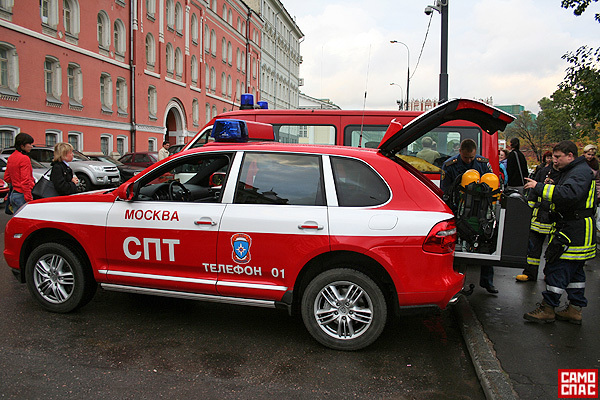 This is in Moscow, where there is no need to drive 60 miles to a fire. What they actually need then is a helicopter. For the price of this car you can buy two-seat chopper. It would be much more useful. I don’t know many cities or even countries that use fire helicopters. Can you give some examples? I don’t know many cities or countries using Porches for firefighting. And there’s not really much more room in Porche than for the bucket of water. Not more than in a small helicopter. Maybe the helicopter pilot even bring a bucket of water along to toss on the fire. Those “remote” places (such as Siberia) you’re talking about have the worst conditions in Russia-they get almost no funding. Most (if not all) users of this site live in Moscow/St. Petersburg. There wont be any fire to PUT OUT if You have o drive 200 miles! 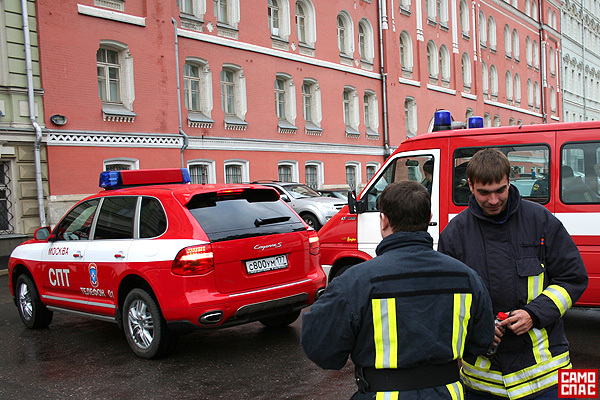 Maybe mother russia should invest in a few more fire stations huh? Good point. He (or she) could drive 200 mph to the fire with an extinguisher and then drive back really fast when he needs to refill it. Isnt CNT abrieviation for that other C word ? This is an abbreviation for “Fire Extinguishing Service”. I think its a real shame that they would rather spend their resources on unnecessary luxuries then provide more financial incentives for the police officers in order for them not to take bribes. But I guess that’s just how things are done in russia. 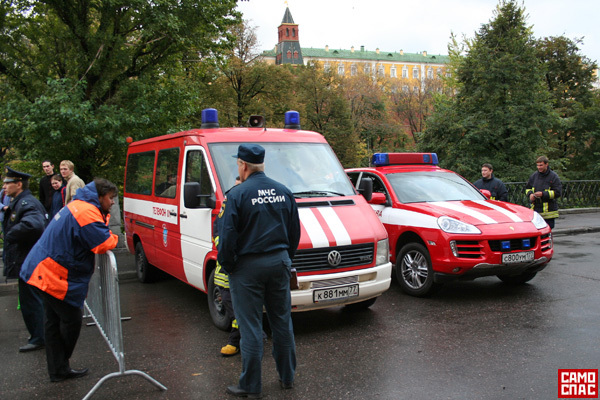 This is where all the money towards Moscow and St. Petersburg goes… To buy Porsches for firefighters near the Kremlin (as seen in the last picture) and Audis/Mercedes for Putin’s guards. Many Russians may seem that their country is just great and there are no problems. Some of them don’t even live in Russia anymore, and those who do, refuse to accept the belief that there are many problems. Plus the rest of Russia (excluding Moscow, St. Petersburg, Sochi, and other European areas) has virtually no tourists at all, hence the much worse conditions. does any body know ( D , Boris ) how to stream an embeded video thats on a website in such a way that it would be saved on your harddrive as a media file? i know how to save mms:// stuff like that but embeded videos arent mms , any ideas? That would be my choice, there are many firefox plugins that can do this. It depends. The QuickTime movies that are on subscription sites like VTC are nearly impossible to save without a screen recorder. Even with a screen recorder, you aren’t guaranteed a copy. If it is a non-protected video file then the type of plugin that Boris mentioned may work. There are various aps too. 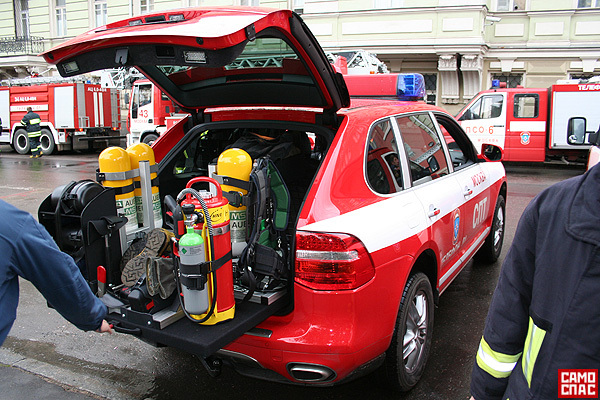 As I have written above, the fire department did’t buy this vehicle. 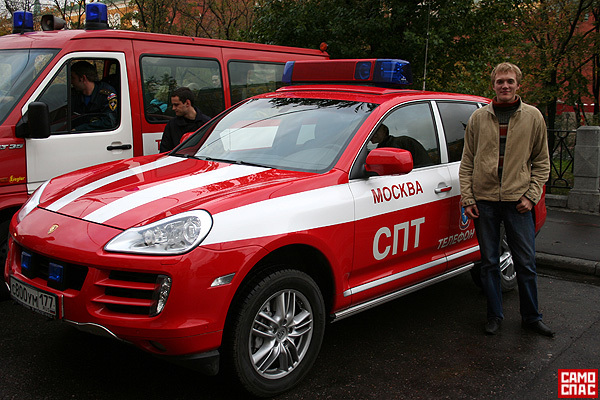 In fact, this custom-built SUV was given by Porsche as a gift. It’s a smart publicity move, as Porsche just opened a $19m dealership center in Moscow. Is this comment going to have you deported to Siberia? That’s a really immature comment, you Russian patriot. Lighten up, it’s a joke. Probably no in his own posession. It’s not his gauge. Dut Rolls-Royce could be more strange as an equipment of the FD. But his blood relatives do. What do you want to see from a people who came from a regio with aboriginal society? They can’t reject an opulence. And the remark about kickback is very exact.